Ask a pony owner and they'll tell you, ponies are tougher, smarter, stronger and healthier than any horse. They tend to be hardier, have few hoof problems and are less prone to some types of colic. They run on a lot less fuel too. Rations that would starve a horse will keep a pony round and energetic. Most pony breeds developed where the pasture was very sparse, the terrain rugged, and the climate harsh. They had to work hard to find their food. And so, in a short time, they have evolved to use what little food they could find very efficiently. When we pamper them, feed special preparations and lush grass we very often do more harm than good. 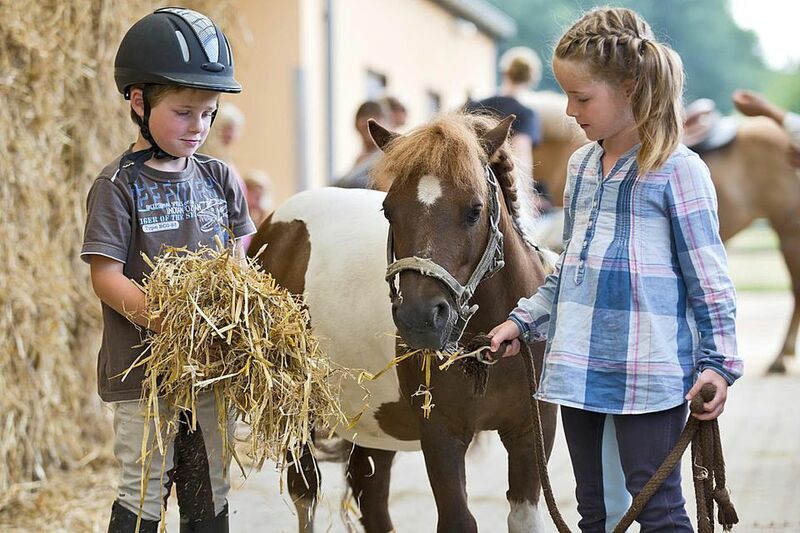 Overfeeding is more often a problem for ponies than underfeeding. Ponies need only the fraction of the feed that horses do. Hay for ponies should be good quality grass hay. Your pony probably won't need the nutrition provided by alfalfa and clovers. These fodders, which are more energy and nutrient dense than many grass hay, are often too rich for a pony. Lush pasture is a danger zone for ponies. Ponies can founder in less than 60 minutes of grazing if introduced suddenly to lush grass. If you plan to keep your pony on grass introduce it very slowly. Start with 10 minutes of grazing and gradually add a few minutes each day twice a day. If your pony eats too much rich pasture it could lead to such things as colic or founder. You may never be able to leave some ponies on good pasture. Ponies can become obese very quickly and that can lead to health problems like metabolic syndrome. Good pasture for a pony would be one that he has to work at finding the grass in. Sparse grass that grows slowly would be ideal. Or he could spend a small portion of his time on pasture and the rest in a grassless paddock. It might be necessary to keep a pony off of pasture for a portion of the day. It sometimes takes a bit of creativity to find ways to restrict the amount of feed your pony is getting. Some people use their round pen or a paddock where no grass grows. Another option is to use a grazing muzzle. Grazing muzzles let a pony graze, but only get a few blades at a time. The spaces in the muzzle also allow the pony to drink, so of course, make sure your pony has access to clean fresh water. Ponies rarely need concentrates or grain. The exception would be a pony that is working very hard: one that is doing several lessons a week is being driven frequently, is doing something like pulling competitions, or is a lactating mare with a foal by her side. If your pony is losing condition you could increase the quantity of hay and if that isn't enough add a concentrate that isn't too rich. A forage replacer fortified with vitamins and minerals might give your pony the nutritional energy boost it needs without adding extra pounds. If you like to feed your pony even if it is not working hard--and for some owners, this is a very satisfying activity--look for a concentrate that is low in calories. Some manufacturers make special pony mixes. These mixes are balanced with the correct amount of supplements for a pony. Don't be tempted to top dress it with a lot of extras like molasses or beet pulp. If you are feeding good hay, the pony is getting a bit of pasture and you have a mineral/salt block available your pony will be getting what he needs. If you feed treats, it’s best to consider these into the overall diet, so you won’t be overdoing it. Pony mouths are small, so overgrown teeth can be a problem. Hooks and sharp edges can make chewing uncomfortable because their mouths are compact and teeth, tongue, and gums can be closer together than on some horses. Don't forget to have your vet check your pony's teeth to ensure it can chew easily. You don’t want your pony losing weight because it has a sore mouth. A sore mouth can also lead to behavior problems while carrying a bit. Ponies also need regular de-worming to keep them in the best health.